It´s attributed to Lennon & McCartney as are the rest of the songs each of them wrote for The Beatles, but this one is all John. Like I´m a loser and Help it´s one of Lennon´s personal records, where he writes from first hand experience. 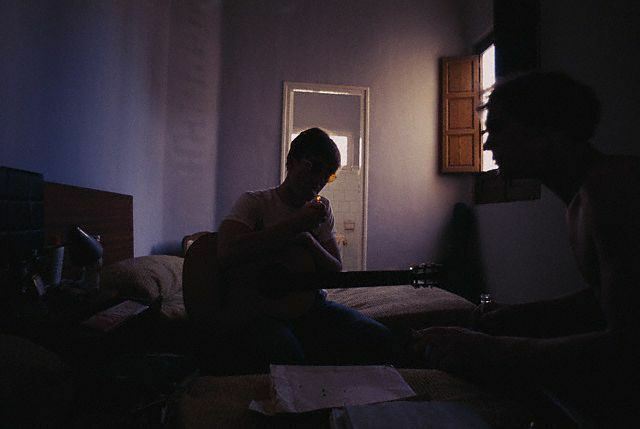 It took a few years to grow on me, but after hearing the home demos recorded by Lennon, I suddenly got it. The bootleg tape I had at home in Ireland as a teenager was lent to me by a friend, and if I remember correctly, the first two verses were lined up together, maybe it was just the three verses with no chorus. It originally started with the verse “No one I think…” If anyone knows of that demo recording I´d love to hear it again. I´ve just been searching through youtube for rare demoes of the song and it sounds like it may have been one of the Kenwood demoes. It´s a bit messy, because it´s an extract from his tape recordings, and he´s overdubbed a vocal over another demo, but it´s well worth a listen. When I think of Strawberry Fields I don´t just consider song to be the single that was released. For me the song stretches from the demos in Santa Isabel in Spain, and his home Kenwood, to the early Beatles takes and on towards the finished version. Actually John was never happy with how it turned out and it was one of a handful of Beatles songs he would have liked to re-record. Having dinner with his old producer years later he said to Martin that he’d like to re-record every Beatles song! “Especially ‘Strawberry Fields,’” answered Lennon. Unlike Paul, he wasn´t a fan of layering songs with strings etc, but in this case he was the one who asked their producer George Martin to come up with something for it . McCartney was specific with what he wanted with his songs. He´d hum the melody he wanted the violins or trumpet to play, whereas Lennon famously asked Martin to make a song sound “like an orange”. However, it´s not often that an artist does achieve his or her grand ambitions, and Strawberry Fields Forever is for me one of the grandest. You can visualise perfection, as was the garden of John´s youth, but capturing that perfection is a different matter. But we can hint at it. You can point someone in the direction. And the tools we use are imagination and memory, but can you separate the two? It´s like James Joyce once said echoing Giambattista Vico ,” imagination is memory”. When you listen to how it started out, you realise that he originally had something more gentle, more subtle in mind. Have a listen to the beginnings of the song when it was provisionally entitled: “It´s not too bad”. It´s probably for Beatles fanatics only. 🙂 But then again I think everyone should be a Beatles fanatic. John´s aunt Mimi was quite strict and didn´t like him going there, as it was basically an orphanage, and she thought the boys would lead him astray. When Mimi argued with him about it he would reply: “They can’t hang you for it.” which inspired the line “Nothing to get hung about”. He felt a kinship with the lads, after having lost his father (who left home), and later his mother Julia, who he was not allowed to see as a child once he´d moved in with his Aunt, and who later died in his teenage years, after being hit by an off-duty policeman who had been drinking. For Lennon fans, this is essential viewing. He pulls no punches. 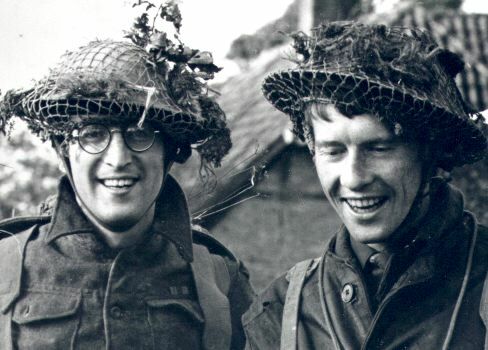 In 1966, John took time off from The Beatles hectic scheduling by signing up to act in How I Won the War, a movie by Richard Lester (the director of A Hard Day´s Night) which was being filmed in Almeria in south eastern Spain, with Michael Crawford, with whom he shared a house with, along with their two wives, for that summer in Spain. 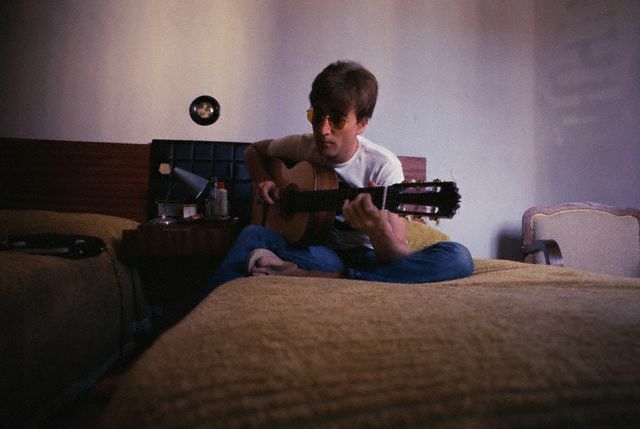 They´d sit around the house in the evening and John would play guitar, singing “Strawberry Fields… No, that´s not right”. Michael encouraged him, telling him it was wonderful. 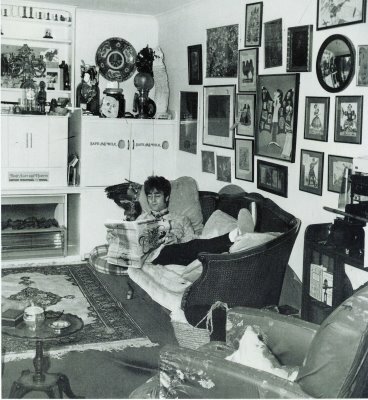 Thanks to Beatlemaniac Maxime for providing a link to this rare photo and others, which you can find the links to below in the comments section. Incidentally that´s when he started wearing those unmistakeable Lennon glasses (they were given to him as part of his army regalia along with a new haircut) as you can see above, the same style as those that were originally worn by his hero Peter Sellers. Aside: Actually the reason they chose Lester to direct A Hard Day´s Night in the first place was because they had enjoyed the short film Lester made with Spike Milligan and Peter Sellers in 1960 so much. It was called The Running Jumping & Standing Still Film. 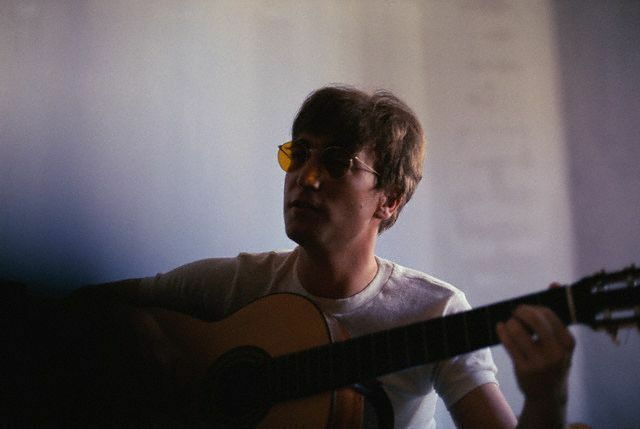 John´s eyesight was quite poor (he was near-sighted), but he used to go around without his glasses during his youth up to the early years of The Beatles, so it´s quite interesting that this was the time he chose to start wearing his glasses more regularly. When you hear the line “living is easy with eyes closed, misunderstanding all you see” you realise that he´s really talking about himself again here. It´s a metaphor for an approach to life, but in reality that´s exactly what he was doing, walking around with his eyes closed to those around him, blocking out pain and blocking out people. 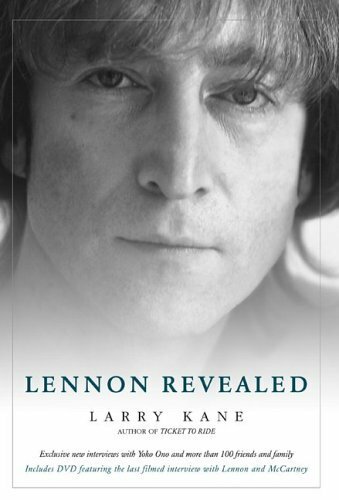 Larry Kane wrote in Lennon Revealed (2005) about how surprised people were that John Lennon was insecure under all the bravado he liked to show to the world. John said in his later years that he had two sides to his personality, one-half “monk” and one-half performing flea. During 1966 Lennon´s ego had been battered by a steady dose of LSD, his self medication to deal with that pain, and by the time he got to Spain, he was exhausted from Beatles commitments and the constant mental activity involved with taking the drug. This was his first real break in a long time. It was also a break from the drug for a while, although he did keep smoking the occasional joint while he was over there. During the LSD come-down his mind drifted towards images of childhood alienation, lost innocence and shattered reality. When John finally brought the song to the studio and played it for George Martin, who said he felt the song conjured up a “hazy impressionistic dreamworld.” I imagine it sounded something like these recordings. Martin had recognised immediately that Lennon was entering unchartered territory. He remembered “a starry echoing line” and quickly asked him how he wanted to record it. 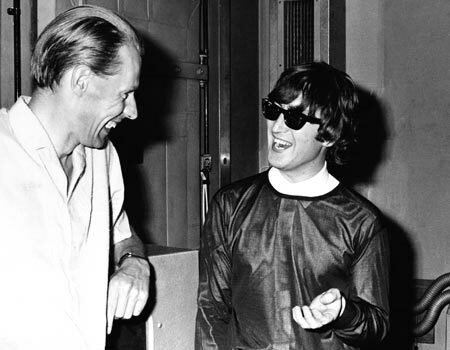 Lennon laughed and reminded him that that was surely the producer´s problem and not his. That was the first time they´d ever re-remade a song, they´d generally abandon a song if it wasn´t working out. Between them they worked out that it should be three cellos and four trumpets, along with the group, maracas, tambourine, bongos, acoustic guitar and piano. When Martin had finished scoring the part and bringing in the musicians, they recorded it again, and Martin was happier with the end result. John went off again. Working with Engineer Geoff Emerick with only a pair of editing scissors, two tape machines and a varispeed control, they sped up the first and slowed down the second changing them both to Bb, and to Martin´s surprise, the splice worked! The tempos matched. The first half actually starts off a little flat and then speeds up a little to bring it exactly to Bb just before the splice happens. Lennon loved the end result at the time, and Martin was very happy with it too, but being perfectionists, there were still little things that bothered them. When we hear the song now it sounds like one take, but George as their producer still cringes when he hears the splice, which is at the 1.00 mark just as the second refrain starts with the phrase “I´m going to”. When you´re recording a song, there comes a time when you have to finish it. That´s the trouble with seeking perfection. It´s rare that a producer or musician is completely happy with a recording. As for the rest of us, the listeners, if you didn´t know it was there, you probably wouldn´t spot it. Here´s George talking you through some of the production details and you get to hear the magnificient string and brass sections (scored by Martin) on their own with only the drums underneath. 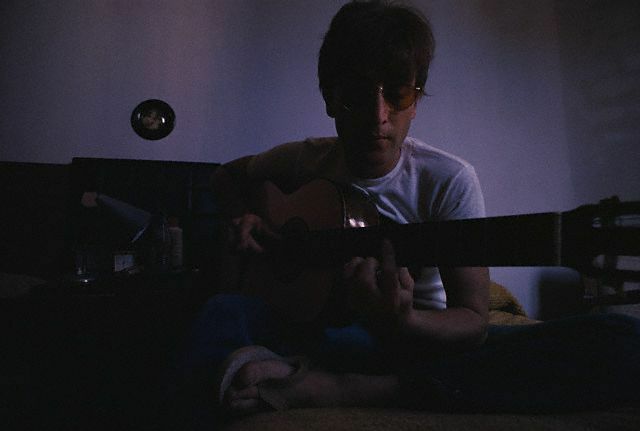 Given the freedom by Lennon to do what he liked on this song, Martin really came into his own, and rose to the creative challenge John had set down. Paul came up with the famous mellotron part you can hear on the first few takes. The mellotron was a new instrument that was lying around in Abbey Road. When you pressed down the keys the instrument would play short pieces of tape with the sound of a recorded flute. This was before the age of synthesizers. As well as playing the lead guitar part, George Harrison played one of his newly discovered instruments, a swarmandal, which is the Indian version of the zither. It also featured a piano and a backwards-recording of Ringo´s cymbals. The orchestral score starts in the middle of the second chorus. The pitch-shifting in the joining of the two versions gives Lennon´s vocals a swimming quality. You can hear the song in progress in the first four takes here, as Paul and George Harrison try out and develop their accompanying parts and Ringo´s drum style starts to form. An early idea for a block harmony is ditched early on. 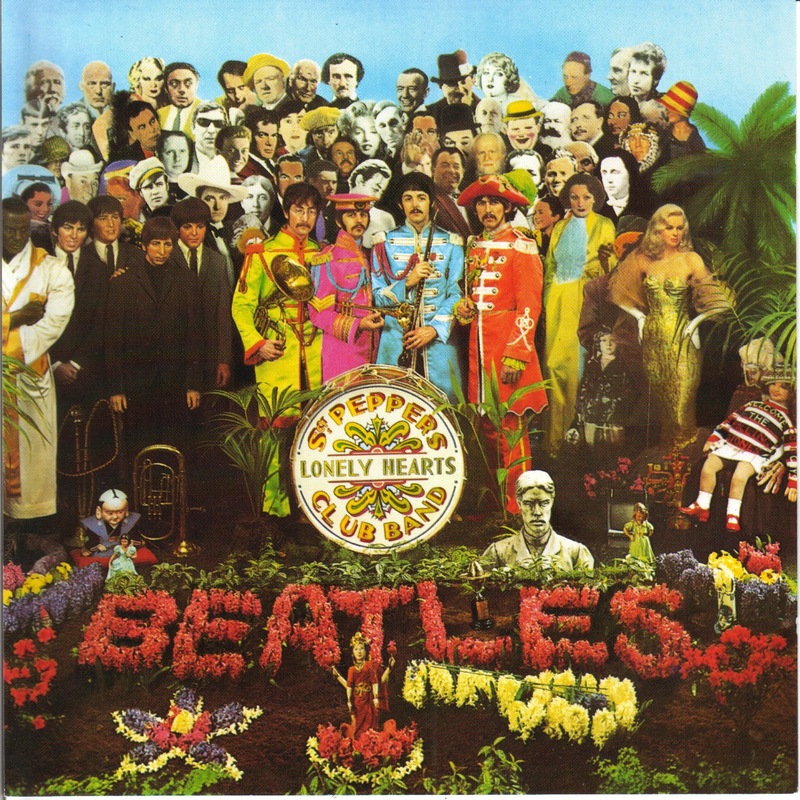 The song was originally intended for Sgt Peppers, and was really the start of the new Beatles sound, but instead it was released as a double-A side with the very different sounding McCartney composition Penny Lane. 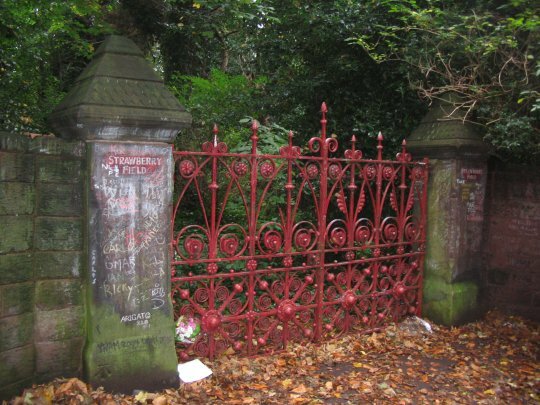 Both of the songs titles are places in Liverpool (about a mile and a half apart in the Allerton area) that The Beatles had known as kids. The idea that Paul and John had been toying with for a couple of years by that stage was to write an album about Liverpool and their childhood experiences growing up there. An earlier example of them trying to do this is the collaboration In My Life. Lennon started out by listing places he knew from his youth to no avail, until he got inspired and the lyric came to him. Paul is thought to have composed the melody for that one. As they had previously done, The Beatles philosophy at the time meant not including singles on their albums. It was originally intended as the centrepiece of Sgt Peppers, but the Beatles needed a single as they had been out of the public eye for a while. Martin expressed regret years later that he didn´t include the two songs on the Sgt Peppers album, calling that a “dreadful mistake”. For the first time since Love Me Do, A Beatles single not reach number 1 in the British charts, where it peaked at number 2, which is quite ironic, as for many, (me included) it is their masterpiece. It was kept off the top by Engelbert Humperdinck´s Release Me. 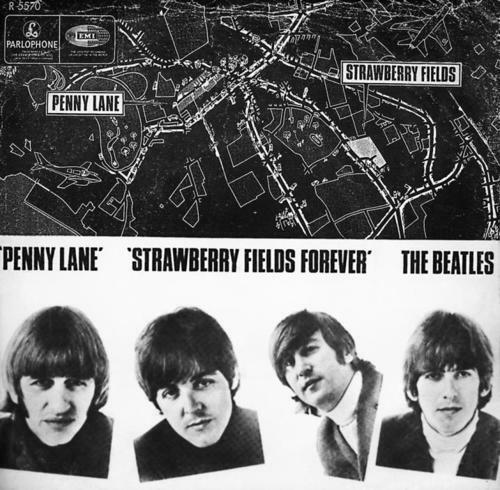 In America, the two were released separately and the more accessible Penny Lane hit number 1, while Strawberry Fields Forever reached number 8. The two songs were also included in the Magical Mystery Tour LP released exclusively in the U.S. in December 1967, while in the U.K. Magical Mystery Tour was released as a six-track EP featuring only songs from the movie. Although it was released as a double A-side the BBC counted it as two individual singles, even though the record had outsold “Release Me” by almost two to one. 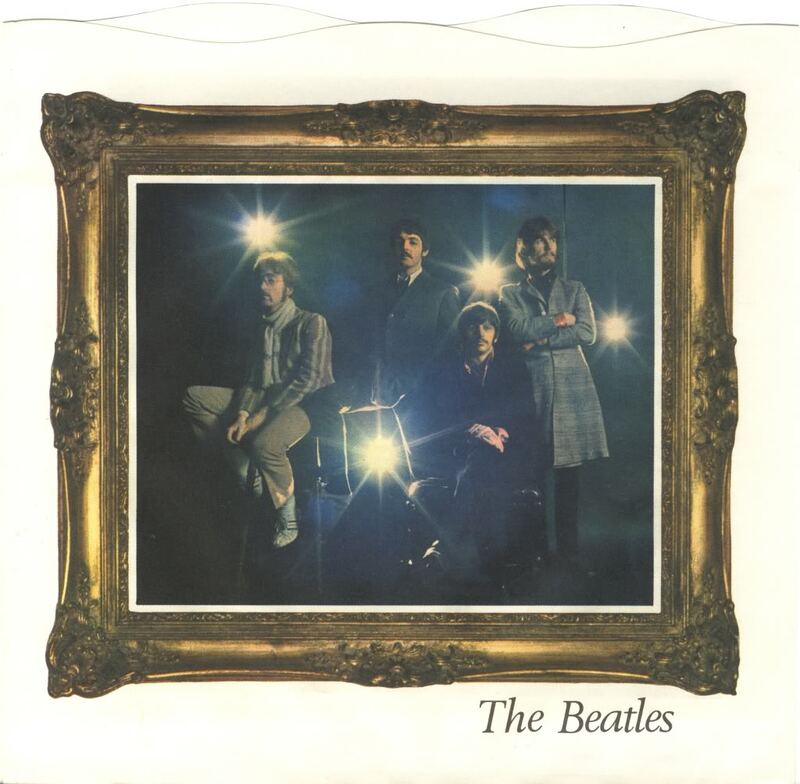 The song was regarded by critics as the best thing The Beatles had done yet. A young Brian Wilson, the man The Beatles had considered their biggest rival after hearing the Beach Boys Pet Sounds, was working on the ambitious follow up concept album, provisionally entitled Smile. He had already been beset by numerous problems making the follow up album, record company pressure and pressure from inside the group to produce surfing hits like he used to, as well as his own troubled psychological state, which was exacerbated by his experiments with drugs, particularly LSD. When he heard the single on his car radio for the first time he stopped his car and sat there dumfounded, awestruck and waited for the song finish. Michael Vosse describes being in the car with Brian at that moment. 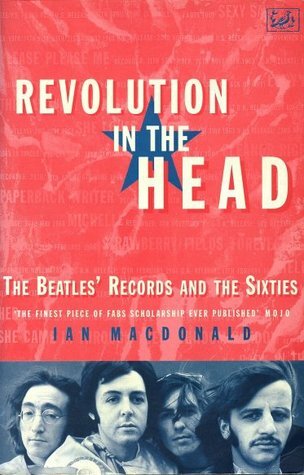 And if you haven´t got it already, you should check out Ian MacDonald´s Revolution in the Head, where he goes through each Beatles song and analyses and appraises the songwriting, recording, writes about the background, and the considers the impact the songs had on society. It´s a must for Beatles fans. The promotional film for the song was an early example of what would later become known as a music video, and was filmed on the 30th and 31st of January 1967. It was directed by a Swedish film director named Peter Goldmann, recommended to them by their old friend from Hamburg, Klaus Voorman. The shooting took place in Knole Park, which is located in the Sevenoaks district of Kent, near London. Let me take you down, ‘cos I’m going to Strawberry Fields. Nothing is real and nothing to get hungabout. It’s getting hard to be someone but it all works out, it doesn’t matter much to me. No one I think is in my tree, I mean it must be high or low. That is you can’t you know tune in but it’s all right, that is I think it’s not too bad. Always, no sometimes, think it’s me, but you know I know when it’s a dream. I think I know I mean a ‘Yes’ but it’s all wrong, that is I think I disagree. I just found this on youtube, and I think it´s very interesting, because it marks the change they were making from a group with a following of hysterically screaming teenage girls to a group that were innovating and becoming more experimental. If you listen to the audience you can hear they stop screaming at the beginning of the second video, probably because they are slightly confused about what they are seeing. Penny Lane was a fantastic song, but still fits in with the music they´d previously been making. Strawberry Fields was like a sea-change. Here is a comment on another youtube video from someone who was in school at the time they released the single. This weekly post is just fantastic. Ok, I’m biased on this one but you really managed to give loads of information and still maintain a more than pleasant reading. What a great song, thanks very much for all those crazy details. Oh, one thing though, a detail : the real place, in Liverpool, was called “Strawberry Field”, without the “s”. I know, I know, in beatlemaniac, there is “maniac”. Thanks a million Max, but you´re actually correcting John and not me. 😉 Lennon used to call it Strawberry Fields even though the original name was Strawberry Field, so in the quotes from him, I haven´t changed his spelling of it. Actually I´ve just noticed I did spell it wrong when I mentioned it! Damn, you got me. 🙂 Editing on the fly here, cause I was up till 4am last night writing it, so if you notice anything else let me know. Yeah, there´s plenty of lovely little details in this one. For a couple of the recent posts I struggled to keep things interesting, either due to a lack of information or too much! 🙂 Glad you enjoyed it as a fellow Beatlemaniac. Ah very good Padraig ! Again, this post was extremely enjoyable, so are the others. Well done ! Love, strawberry and vino de Almería. Thanks a mill. That´s brilliant. I´m going to upload one on here too. What a fantastic entry; just a few nights ago, my husband and I were talking about the ‘hungabout’ line; he had learned what you explain. When I think about the Lennon/McCartney contribution to rock/pop music, it seems overwhelming, feats that really can’t be fully appreciated by most. They changed popular music in so many ways, which is a weak way to describe it, but really, listening to Strawberry Fields after I read this post, good grief! I’ll be thinking about this for a while. Funnily enough, a few Beatles tunes are on one of my NaNo playlists this year. Thanks for following my blog, and for this great post!